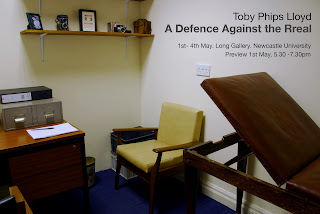 I have an exhibition of new work in the Long Gallery, Newcastle University from Tuesday 1st May until Friday 4th May. Preview: 1st May, 5:30 - 7:30pm. For the exhibition Lloyd has split the gallery space into three sections: a recreation of the artist’s studio, a psychoanalyst’s surgery and a video of the artist being psychoanalysed by himself. The three sections are placed to correspond with the Real, Symbolic and Imaginary orders identified by Jacques Lacan to represent the human mind. These orders are seen as three interlocking rings: a Borromean Knot, if one is removed the whole structure will collapse and result with insanity. The exhibition is a journey into the artist’s unconscious as Lloyd holds a mirror up to himself and attempts to examine the space that lies between fantasy and reality, this he describes as the Rreal.